I’m so happy to be enjoying the spring like weather this week in San Francisco! The crazy El Nino rains have subsided and I’m thankfully putting away my umbrella for the next week. I’ve been going a bit crazy cooped up inside so it feels nice to get out and enjoy the sunshine! Typically when it’s raining I prefer keeping cozy at home with friends, board games, Netflix and enjoying the time together–but–I can only do that for so long. On this Sunday I wanted to get back into the weekly ritual with my girlfriends to enjoy some coffee while catching up. 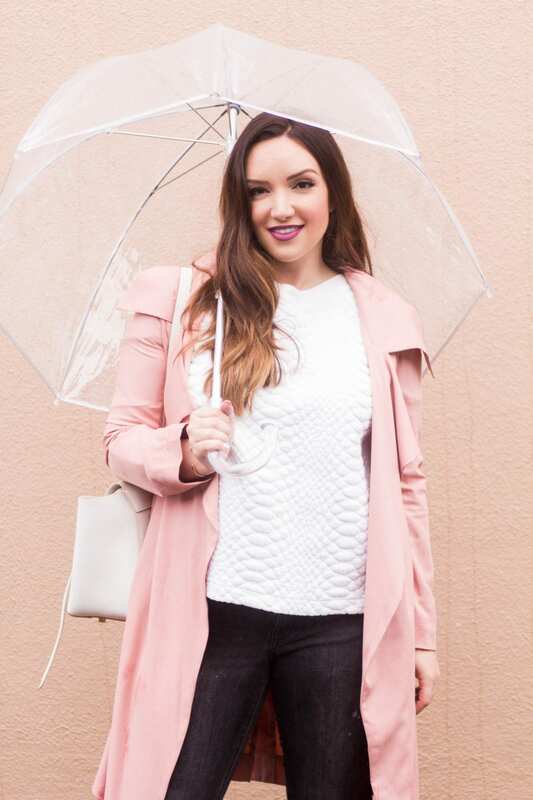 I’ve been loving this blush color for spring and picked up this lightweight trench from Windsor. I like that its lightweight and can be layered for additional warmth. The color is so pretty! 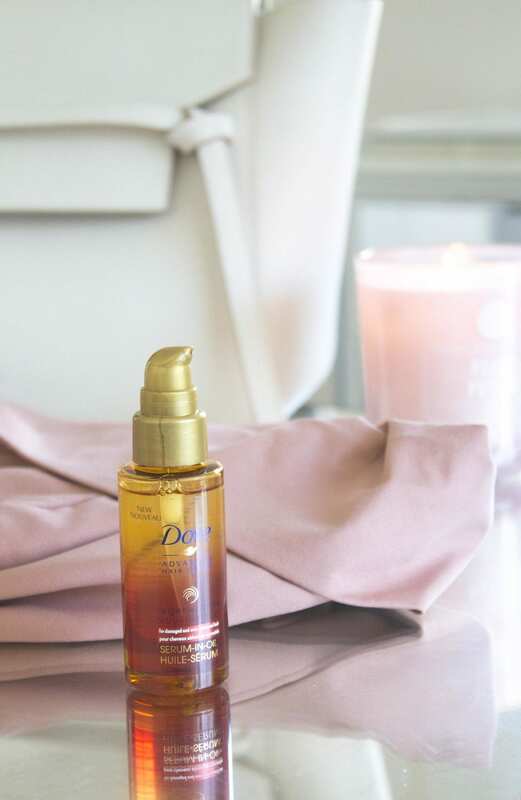 For beauty, I wasn’t about to let the rain wreak havoc on my hair so I decided to go with second day hair with the help of some oil serum to nourish and give it some new life. I’m currently loving this Dove Regenerative Nourishment serum that I snagged at Walgreens to make my ends super hydrated. I squirt about 4-5 pumps into my palms, rub my hands together, and then lightly run my fingers through my hair from midway to the ends. The oil helps smooth any bedhead frizz and add extra shine. Take that El Nino! Does this happen to anyone else…once the end of the week rolls around I’m always looking for my favorite lipsticks. When in doubt, I can always find nearly ten of them at the bottom of my purse. I’m always tossing one into my bag and forgetting that it’s there! Today I’m wearing Fig from Too Faced and I love the color, purple is so great for brunettes! Want to try this frizz-fighting serum for yourself? Head to Walgreens for $5 in Register Rewards when you spend $15 or more on participating Dove products from 2/7/16-2/13/16! Love the coat. Such a pretty color and I also love the Dove Serum. When my hair is straight, I put a little on the ends. Yes I use it on my straight hair too! Makes my thirsty ends very happy! First time to your blog..I LOVE IT!! 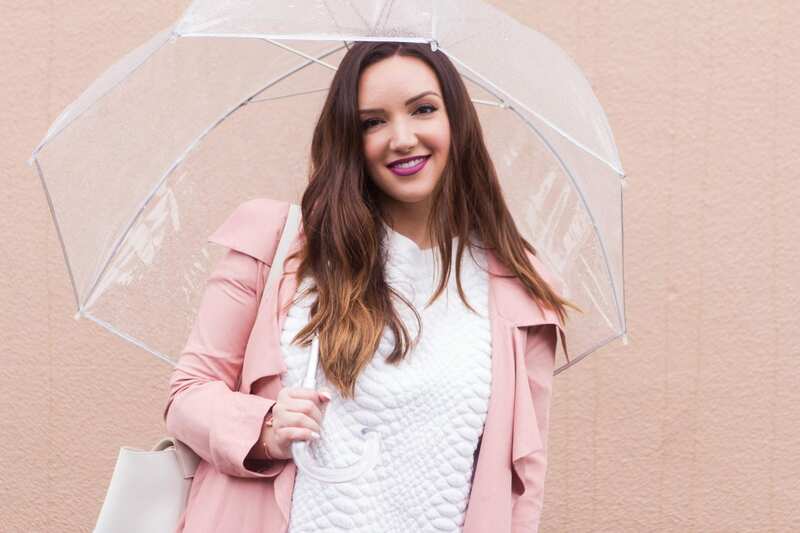 This pink trench is so gorgeous, and I love how you styled it…beautiful look~! I also am obsessed with SFO…how luck you are to live there! I went to college in that area, I miss it so bad!! That trench is adorns! They’re are few things I like s much as a good trench coat- they are so versatile and polished. This is an absolute dream of a look – killing it! I love this trench coat. I only own the typical tan! This makes me want to branch out a bit! Also loving that lip color!! What a gorgeous outfit and trench coat! Just love love! Omg that pink trench is fab! I have been wanting to get my hands on a trench for as long as I can remember. First of all, you are beautiful! Second of all, I love that you shop at all of my favorite places and that I could actually AFFORD buying all of these lovely pieces!! I need those jeans immediately! What a pretty colour of trench coat! Way better than black. 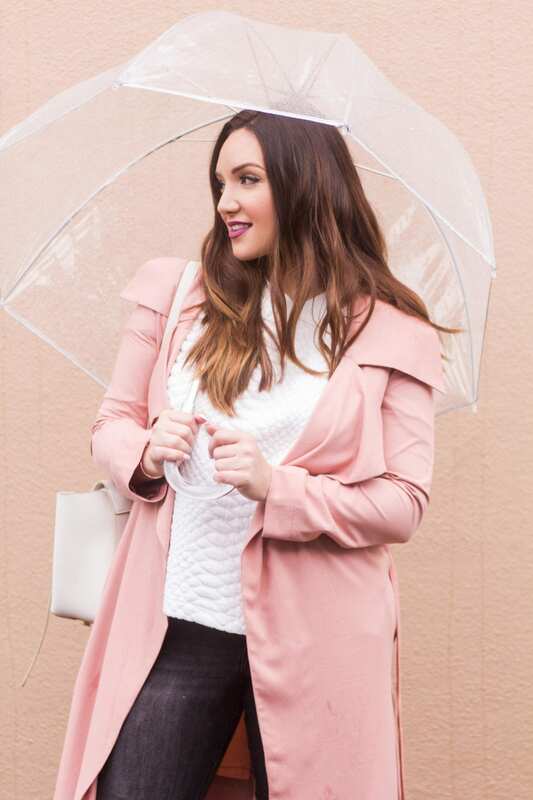 Love the trench and the umbrella! Beautiful outfit! 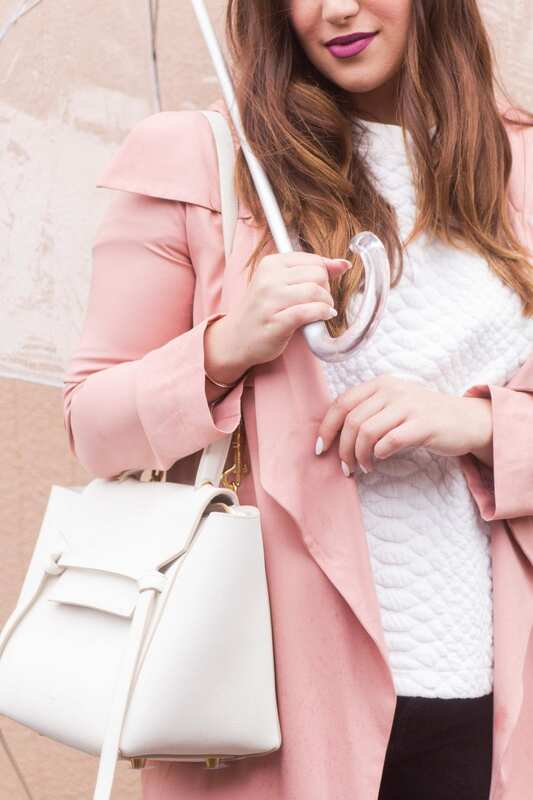 I like all the pink tones and the unique umbrella!